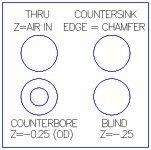 The shapes below help you learn how to design in the eMachineShop CAD. 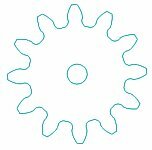 Click on the shape closest to what you want to draw to see how it was created. Also see Linear Slide and Dovetail. Also see File | New | Sample Shapes and the Wizards. Dovetails are a common method of making two parts fit together that must slide linearly. Draw a smaller rectangle inside the first so that the left and right ends meet the ends of the outer rectangle. Choose Line | Machine | Side wall | 45. Choose View | 3D to verify the female part. Choose File | Save | DovetailFemale. 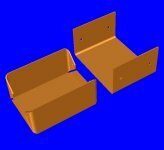 Choose File | SaveAs | DovetailMale. 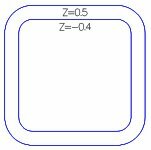 For the inner rectangle set Z to 0.5. Choose View | 3D to verify the male part. 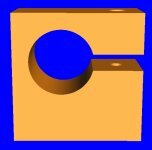 Choose View | Right … add Comments To Machinist to flatten the sharp edge by ~.05″ and, if desired, to not machine the short ends of the dovetail. Adjust the designs so that clearance between the two parts is more than the tolerance you select for the job. 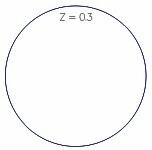 Set the Z value of each circle as shown. Line | Corner | Round. Line | Contour | Inner. Set Z values as shown. Side holes and cutouts can be added in side views. Draw concentric circles in the top view. 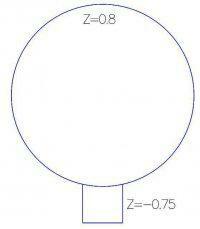 Draw a circle in the Top view. Set Z to the length of the spacer. 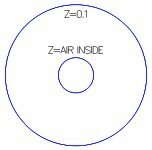 In the Front view draw an arc and straight line at the top and bottom with Z = Air Inside to specify that all material inside the line should be removed. Draw the shape shown by the bold line. Draw a circle for the retaining screw. 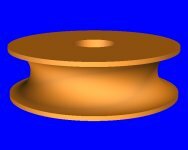 Choose Line | Machine | Thread and select the desired thread. 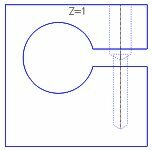 Set Z to slightly more than the length of the screw. Create the outermost circle for the unthreaded bore using a diameter slightly more than the screw size. Set Z to the depth of the unthreaded portion. Verify that the light projection lines are as shown. Create a circle in the top view. Draw the cross section to be revolved (the dark line) which must be to one side of the center axis and must touch three sides of the rectangle. Set Z to Revolve. The light colored rectangle and center line are created automatically. 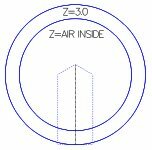 In the Front view draw the cross section to be revolved (the dark line) which must be to one side of the center axis and must touch three sides of the rectangle.. Choose File | New | Gear. Fill in the desired parameters. 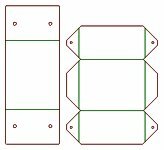 Draw the outer rectangle, inner cutouts and mounting holes if needed. Choose Job | Finish and consider adding one more more finishes such as brush, anodize, powder coat, etc. Choose Line | Machine | Auto | Chamfer and select the desired settings. For the angle use 90 minus head angle / 2. For example, for an 82 degree head use (90 – 82/2 = 49). For the outer circle set Z to minus the bore depth. Set Z to a negative value less than the overall part depth. Let’s assume Z = 0.4 for the outer rectangle and that all but the Z = -0.2 notch is already drawn. 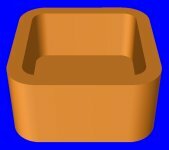 At the location of the notch draw a rectangle extending past the left edge of the outer rectangle and past the large arc. Nudge the copy fully away from the original, using the arrow keys. 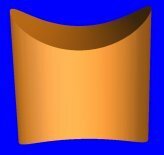 Remove all lines except the shape corresponding to the arced notch. Group the lines of the notch. Delete the original notch rectangle. Nudge the arced notch into place. At the location of the “foot” draw a rectangle extending inside the outermost circle. Delete large arc and straight segments inside the circle. Group the lines of the “foot”. Select original rectangle and circle. 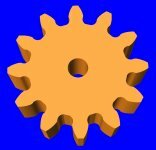 Delete small arc and straight segments inside the circle. Group the lines of the boundary region and set Z to 0.8. Nudge the “foot” into place. One type of linear motion slide has a square groove along which an upside-down T shape slides. Draw a rectangle 10 x 3″. Center the second rectangle in the first. 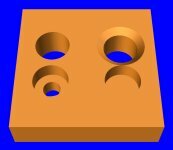 Enter .25, .25, .25, Add to form the square groove. Click the Pyramid button to see the 3D view. Set diameter to the diameter of the sphere. Click the circle tool and snap a circle from the center of the dotted line to the midpoint of the right edge of the square. Draw a Line from the top of the dotted line to the bottom of the dotted line. 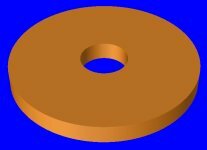 Click on the Eraser tool and remove the left portion of the circle. You are left with a half-circle. Click on the 3D preview to view the sphere. You can access additional sample shapes via the File menu. Choose File | New | Sample Shapes . 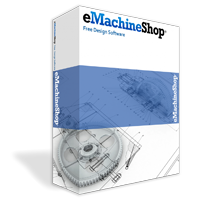 Also review samples via File | Open | C:Program FileseMachineShopSamples.